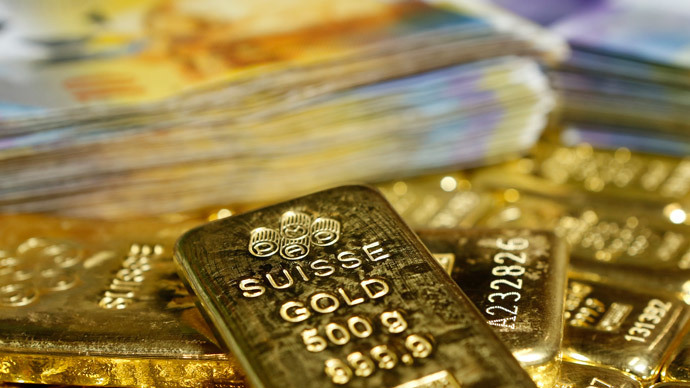 Central banks across the world have purchased a record 477.2 tons of gold in 2014 as an attempt to reduce the influence of the US dollar amid global financial instability, according to World Gold Council. It is the biggest amount of gold purchased by the central banks in nearly 50 years, the council said in a report. The majority of the countries bolstering their gold holdings are from the Commonwealth of Independent States (CIS). Russia, with gold reserves of more than 1,200 tons, added 173 tons to its already sizeable stocks. Gold accounts for 12 percent of Russian overall reserves. Kazakhstan and Iraq bought 48 tons each. Iraq has seen its gold reserves triple in a year. Sales of gold by banks were more limited. Ukraine’s sales of 19 tons was the most sizeable, but pretty understandable, as the current economic situation in Ukraine if forcing the government to sell. The global economic slowdown, coupled with political unrest and falling oil prices have pushed monetary authorities across the world into so-called currency wars. Over the past year the EU, Russia, Ukraine, Singapore, and India have eased monetary controls, with the Russian ruble and Ukrainian hryvnia losing more than 50 percent of their value.